This is a guest post by Rob Lawton, an author, executive coach, and expert in creating rapid strategic alignment between enterprise objectives and customer priorities. He has directed strategic and operational improvement initiatives since 1985. Lawton coined the term “customer-centered culture” with his first book, Creating a Customer-Centered Culture: Leadership in Quality, Innovation and Speed (ASQ Quality Press, 1993). He has been published in Brazil, China, the U.K., and is referenced widely. Many of his articles are available at www.imtc3.com. Contact him at Robin.Lawton@icloud.com. 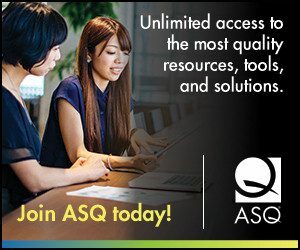 The Forbes Insights-ASQ white paper published in fall of 2014 distills several guidelines from interviewees that can be especially useful with more detail. My purpose in this three part blog series is to provide details and references to the missing specifics for successful action. 1. All employees must apply the four key elements of any strategy for building a quality culture. (Page 8: Boeing’s Ken Shead). Part Two in this blog series spells out how to successfully address point #2, above. “Duh! Well, of course!” would be the expected response by many leaders and quality practitioners to this exhortation. The intent to understand what customers want is easily agreed with but not well executed. Most culture change leaders do not have the time, patience or inclination sufficient to adequately understand and apply the many quality methods and tools available. Abundance, complexity and competing priorities abound. The voice of the customer (VOC), customer experience, QFD and other labels refer to organized ways of uncovering and satisfying what customers want. They’re all valuable but not necessarily easy to apply or relevant to every organizational setting. Unfortunately, the vast majority of information is aimed at widget-making enterprises. Only 13% of us personally make widgets so we need another way. There are two practical and easy-to-apply versions of the cultural transformation roadmap. For those leaders who prefer text and a step-by step recipe, follow the path of answers to questions 1-8 covered in the first blog in this series. 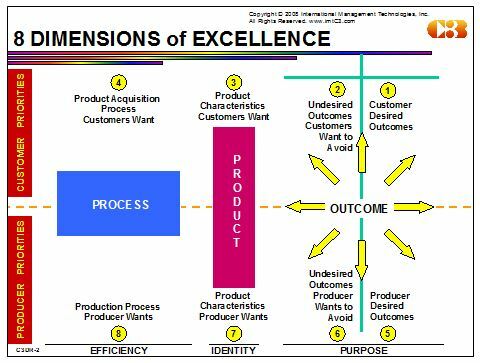 For those of us who like pictures, think in terms of relationships and systems, like a reference that applies to every aspect of excellence in every context, and want to be able to point to “we are here,” use the 8 Dimensions of Excellence graphic below (more on this graphic). A culture of quality must address all eight topics labeled in this graphic. Attacking the Dimensions in the sequence shown by the numbers works best. Traditional quality management practices put especially heavy emphasis on Dimension 8. In fact, most initiative names (lean, Six Sigma, activity-based costing, business process improvement, etc.) explicitly work on processes to benefit the producer. Dimension 4, the customer’s process for acquiring and using the product, generally gets far less attention. An easy way to test whether what we have said we value is actually valued is to examine what gets measured regarding each of the 8 Dimensions. Most healthcare organizations will admit that their customers (patients, let’s say) want to achieve, above all else, “good health.” This is the voice of the customer for Dimension 1, their ultimate desired outcome, and should not come as a surprise. Yet the vast majority of healthcare providers have no written definition for good health (though the World Health Organization has had one since 1948), has no measure for it, and no numerical goals for improvement. Other than that, everything is wonderful. Happily, there will be many measures for other things, mostly regarding operations and compliance, but the most important customer outcome is not defined, measured or linked to compensation or performance reviews (but volume, cycle time and cost are). Customer surveys ask many questions (on courtesy, cleanliness, wait times) but few to none regarding the good health outcome (not to be confused with the clinical outcome). We assume high scores indicate satisfaction, but we have carefully chosen which questions to ask and which to avoid. The power of customers is therefore diminished and staff behavior is not linked to what the strategic plan intends. The third blog in this series will outline the specifics of taking action on the third major research finding: Develop policy, common language and leader behaviors for deployment.